Last summer, exactly a year ago as a matter of fact, I started this blog with the 70s summer movie retrospective. I covered a lot of odd films but also some well beloved popular movies. I am going to continue posting reviews of films I see in theaters this year, but I thought I would add some occasional theme posts for the summer. I may do an 80s retrospective but I hope to pull in a few of you who read the blog periodically by asking you to respond to certain movie prompt postings. For instance, listing your favorite movie poster for a particular film genre, or guiltiest comedy pleasures. The family is driving some of the topic ideas but I want the community to offer suggestions as well. Here is an example of what I am talking about. 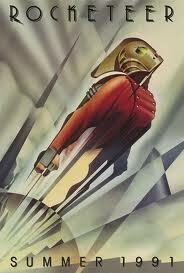 I love this movie poster, it is from a wonderful adventure film set in the 1930’s. If you are looking forward to the Spielberg “Tintin” movie this Christmas, you should love this movie. Even if you don’t care for the film, you have got to love the poster. This is an art deco, sci-fi retro dream come true. Is there a poster that you think is as beautiful? Let me see it. Please post a link or the image itself. If I get enough suggestions, I’ll put together a slide show and we will all discuss together.